Remember the name: Farouk Miya scored the decisive goal which ended Uganda’s almost four-decade absence at Africa’s biggest football showpiece. His meteoric rise to the top has not been a fluke, starting to kick a ball aged five. In all this, the soft spoken player has not let money and fame get to him, writes Denis Bbosa. 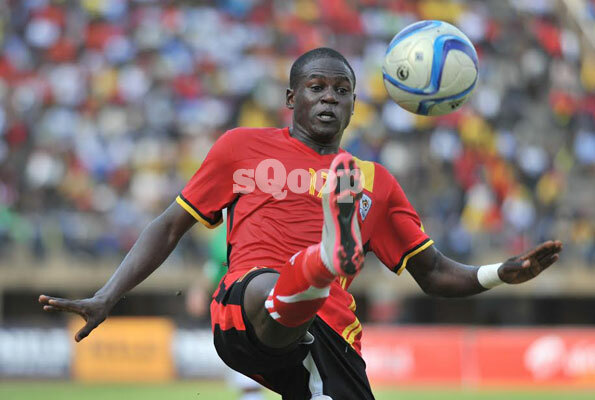 Teenage sensation Farouk Miya has only played 24 matches for Uganda Cranes but he is now well known across Uganda. After scoring the monumental goal against Comoros that broke the 38-year Afcon jinx, the attacking midfielder, who plies his trade for Belgian giants Standard Liege, has his reputation set to spread across the continent. No one could have predicted Miya, only in his second year with national team, would thrive where greats like Magid Musisi, Jackson Mayanja, Hassan Mubiru, Ibrahim Sekagya, David Obua, et al fell short—propelling Uganda to the Afcon showpiece. Miya’s road to greatness kicked off proper in 2014 when he scored on his debut against Seychelles in a friendly game at Lugogo. By then Cranes coach Micho Sredojevic’s midfield consisted of Tonny Mawejje, Luwaga Kizito and Godfrey ‘Baba’ Kizito—Miya’s entrance forcing Luwaga to the wings. Nothing can separate Miya from his mother, a matron at Kyambogo University. Fondly known as Maama Farouk by the Kyambogo folk, his mother guided him through the formative years, tirelessly and routinely tracking his classroom performance at Kibibi Secondary School and St Mary’s College Kitende. She emphasised religion and discipline, a combination Miya strongly embodies. Such is the mother-son bond that even after attaining stardom and wealth, Miya will always first consult his mother before undertaking any project. Little wonder, he gave his 2015 Fufa Best Player Toyota Premio Award to her as a ‘thank-you-mum’ token. Maama Farouk’s busy schedule barred her from watching her son in action for Vipers from mid-2013 until he signed for Standard Liege at a record $400,000 (Shs1.3b) in January this year. But proximity served her right as she closely monitored and advised him for the two years as he pursued his Art and Design Diploma at Kyambogo University. Miya asked for a dead year when it became apparent he could not turn down a lucrative move to Europe but with a solemn vow to his mother that he will return to complete his studies. “He was a bright boy in class and always his grades bettering many non-footballers. Miya earned the points to join Kyambogo and always dreamed of becoming one of the finest artists in town,” recalls Vipers assistant coach Edward Golola who coached Miya for four years at Kitende. They say success has many fathers but failure is an orphan. Many coaches are all scrambling for the bragging rights of having unearthed Miya. Journalists too are not spared, each claiming to have written the story that brought him to the light. The real kudos should go to talent developer Eddie Butindo, who picked up Miya as a five-year-old and guided him up to Kitende. Butindo, a long-time lecturer at Kyambogo University, recalls: “I saw this young but energetic infant in my neighbourhood kicking the ball around. I was coaching a girls’ team at Kyambogo and I invited him to play for fun as my friend (Maama Farouk) went about with her duties. Miya caught my eye with the way he fitted in with girls and after primary school, I first took him to Gombe SS where he was denied a bursary, before I took him to Bulo Parents. In S.3, I decided to take him to soccer giants Kitende so that he could achieve his soccer and academic aspirations.” Butindo has nurtured almost half of the players on the Cranes team, reminisces. “Miya has rare attributes in today’s footballers. He sees issues in a positive way, does not want to be on the losing side, his work ethic remains the same in training and match days and has sheer determination,” he added. Born in Mulago Hospital on November, 26, 1997, Miya never got to see his father for long. “Unfortunately, I lost my father when I was still young. I started winning medals at every competition I played in and that’s the hunger that drives me each time I step out on the field,” Miya says. Apart from the medal haul at Kitende that included Copa and East African trophies, Miya won the Gothia and Norway Cups as a 16-year-old with Kampala Junior Team (KJT). “He was the top scorer in both tourneys in Norway and Sweden which earned him trials at Swedish club Ifknorrkoping FC while his colleague Dan Birikwalira was also tested at Italian side Hellas Verona. Unfortunately Kitende recalled him midway for the East Africa tourney which halted the deal. Todate, many European scouts are still following his progress at Liege with a view of taking him to bigger clubs,” Sweden-based Mansour Kabugo, who gave Miya his first European adventure at KJT in 2013 chips in. Many would kill to have the versatile midfielder’s fame and probably enjoy his ever growing celebrity status, that’s not Miya. A story is told of how socialites Irene Ntale, Desire Luzinda and Faridah Ndausi hunted down Miya last year when he hit headlines to party with him but Miya just went ‘underground’. While still at Vipers, many of his teammates were said to be members of ‘Team No Sleep’, a notorious group of Uganda Premier League players that party until dawn, but Miya often resisted their advances. “Miya has a deep rooted Islamic faith that bars him from booze and promiscuous nocturnal life. He was ever in the dressing room for matches, led pre match prayers and always reserves a last minute prayer before he puts on his jersey Miya wants you to give him an assessment of his performance of the day immediately after the match vowing to do much better. He will put on his swanky headphones and listen to local music if his teammates have not arrived,” says his former coach Golola. Golola and his fellow coaches are happiest whenever Miya returns from Belgium because he brings along gift hampers. “He bought me a track suit on his first return because I told him I don’t want money, I want tangible things that can make me remember him,” Golola says. It’s not only the coaches that are reaping from Miya’s gradual success, players too. According to Vipers and Cranes box-to-box midfielder Keziron Kizito, who has been with Miya for the last eight years, Miya ‘imports’ in foreign tactics from Belgium to make them better players, so that they too can make the big money moves. “He counsels us to forsake our ways of life and focus on our careers. Even with millions of girls throwing themselves at him, Miya loves and stands by his only girlfriend and has promised to marry her soon. The investments he is making alone have propelled us to work harder and join him in paid ranks,” says Keziron, whose ‘made-in-heaven’ partnership with Miya made him FUFA and UPL MVP last year. For years, Vipers and Kitende proprietor Lawrence Mulindwa had invested heavily in football without a proper target. Mulindwa, for eight years a Fufa president, got a change of heart the moment he pocketed Shs1.3b from the Miya sale. He instantly put in place club structures; started recruiting players with resale value and forbade selling his players to African clubs! Mulindwa takes Miya as his ‘golden’ son, comforts him when things aren’t going right in Belgium (Miya has recently been demoted from the senior team to the U-21 side at Standard Liege) and advises him on how to invest his hard earned dollars. Mulindwa has been footing bills for Miya’s private training like the gym sessions at Sheraton Hotel so that he can work on his speed and power. Expectedly, Miya was first hit by the culture shock upon arrival in Brussels. “Just days when I arrived, April 22, to be specific, I scored in Liege’s 4-1 humbling of Royal Mouscron but I still felt nervous. Everyone congratulated me and the coach told me to keep it up,” Miya reveals. His ‘African dance style’ celebration caught his new colleagues unawares but it is the nod of approval from former Barcelona and Manchester United Spanish World Cup winning custodian Victor Valdez that gave him assurance he would settle in first. “Valdez told me, young man from Uganda, keep playing like that and you will make it,” he says. Miya first hesitated to eat the ‘foreign meals resorting to rice only until team captain Adrian Trabel told him the harsh reality – you have to eat this food to fit in our training regime. He is having French lessons in a bid to start speaking to most of his club mates and hopefully it can get him back in the first team. Cranes coach Micho Sredojevic says Miya is not yet the star he wants him to be yet former Copa chief scout and now KCCA head coach Mike Mutebi say it is time Miya took over the central role at the national team. “The first day I saw him in the school’s football team four years ago, I knew he was the real deal. Talking to him, I saw a character that would drive Ugandan football to a new level,” Mutebi, also a former Cranes coach, says. Next up for Miya is the 2018 World Cup qualifiers against Ghana, Egypt and Congo Brazzaville, and if he guides Uganda to the Russia global showpiece, there is no doubt that his name will be etched in the history books.